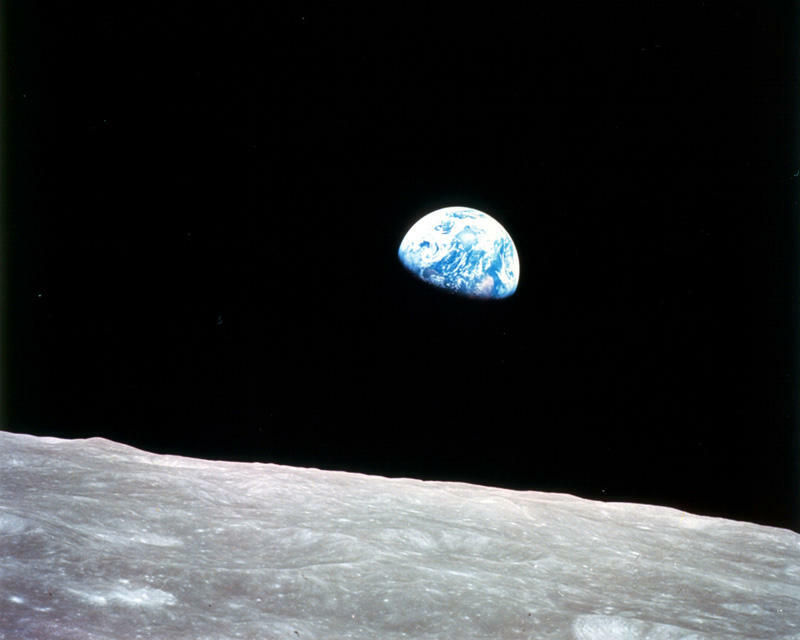 Earthrise: A Mythic Image for Our Time? "So you suggest that from this," Bill Moyers asked his guest, "begins the new myth of our time?" He was referring to "Earthrise," the now-famous photographic image of our planet rising into view above the lunar horizon. The crew of Apollo 8 took the photo on Christmas Eve Day, 1968. "Yes," replied mythologist Joseph Campbell. "This is the ground of what the myth is to be." They sat together on the set of The Power of Myth, a TV special filmed at George Lucas's Skywalker Ranch in California. Lucas and Campbell were friends, as you can probably tell from the heroic motifs that permeate Star Wars. What in the world is a "myth for our time?" And what could Earthrise have to do with it? "Myth" is a funny word in American culture. We tend to think of myth as a lie or as an outdated explanation for a mystery long since cleared up by science. But as Campbell and a host of other mythologists, writers and storytellers have observed, myth is actually a framework of meaning, a set of collective fantasies that story our relationship to each other, the world and the cosmos. To tell a myth is to tell a culture's dream about its inner workings and truths. Myth does not convey these truths literally, however. Like a night dream, a myth tells its tale through symbol, image and metaphor. That is why a literalistic approach cannot grasp myths. They are too slippery, too rich, too multidimensional for that. They don't explain so much as offer an enchanting, elevating or disturbing experience, sometimes giving off bright future visions and sometimes warning us about where we should not go. Myths continually come back to life all around us. No age or people leaves them behind because we always face the recurring problems of life they address. The Big Bang theory is, mythically considered, our Creation Story about how we got here -- a story similar to the cosmic egg that opens in so many myths of other cultures. "Apollo" is an apt name for a space program determined to hit a distant target, for Apollo was a far-seeing god of archery. The planets, the days of the week, the constellations and our galaxy are all named for myths. When scientist Robert J. Oppenheimer watched the first atomic detonation, his reaction was not cool and objective, but mythic: "I am become Death," spoke the god Vishnu in his imagination, "the destroyer of worlds." If myth is a storied way to feel out our place in the world, then we can grasp the significance of Earthrise by considering what it rode in on. The Environmental Movement, ecopsychology, Systems Theory, the Internet that joins us across the globe, global structures of finance, the Goddess movement, the push toward sustainability, organic agriculture, Brian Swimme's inspiring cosmological reveries: these and other worldly-circling matters grew up in the light of Earthrise. This image did not "cause" these movements so much as announce them as they swarmed into collective consciousness. The only myth that is going to be worth thinking about in the immediate future is one that is talking about the planet, not the city, not these people, but the planet, and everybody on it....When you see the earth from the moon, you don't see any divisions there of nations or states. This might be the symbol, really, for the new mythology to come. That is the country that we are going to be celebrating. As Campbell stated elsewhere (a TV interview is a bad time to get technical), he did not believe that a single myth could organize all human affairs from the top down. What he meant was that the rich, multilayered image of Earthrise was just starting to unfold its potential. Even four decades after it was photographed it has yet to reveal itself completely in all its blue-green glory. As we face the increasingly disturbing news about global warming, and as its effects -- including disastrous weather and mass displacement -- accelerate into public view, we might keep Earthrise in mind as a hopeful image around which to rally our efforts to create cultural structures capable of adapting intelligently to a changing planet. We're going to have to be resilient, personally and collectively, as weather worsens and governing institutions either reinvent themselves or shatter. To stand up to what is coming, we must outgrow the kinds of splits that led to such dire results: splits like us and them, self and world, inside and outside, North and South, nature and culture, head and heart. With our view of Earthrise, we could see that the Earth and the heavens were no longer divided but that the Earth is in the heavens. There is no division and all the theological notions based on the distinction between the heavens and the Earth collapse with that realization. There is a unity in the universe and a unity in our own experience.